Residents of American University’s Cassell Hall are now proud to say they live and learn in AU’s first LEED-certified residence hall. Cassell Hall, opened in 2013, earned the U.S. Green Building Council’s Leadership in Energy and Environmental Design (LEED) Silver certification this spring, an achievement in the University’s commitment to sustainability. LEED certifications are awarded to buildings for meeting standards in various sustainability issues, such as resource efficiency and greenhouse gas emissions. The program is now a benchmark in green building worldwide. 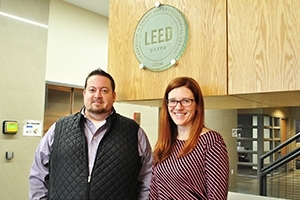 According to Megan Litke, Director of Sustainability Programs for AU’s Office of Sustainability, “the process of thinking about sustainability and LEED certification starts day one of planning.” Site selection, building materials, the construction process, and indoor and outdoor features are all considered for certification. Cassell Hall’s green features include nearly 5,000 square feet of ground-level green roof and a 46 percent decrease in water use relative to standard buildings of similar size. A rooftop solar thermal system heats water, while the entire building is fueled by green power. The certification program considers occupant health and happiness in addition to environmental impact. Materials used inside the building were selected to reduce the number of particulates and pollutants emitted. Over 90 percent of the building has a view of the outdoors; for AU students busy studying, these features reduce stress and promote wellness. Read the full Cassell Hall LEED case study to learn more about Cassell Hall’s green features. Learn more about AU’s residence halls by contacting Housing & Dining Programs and campus sustainability efforts through the Office of Sustainability.